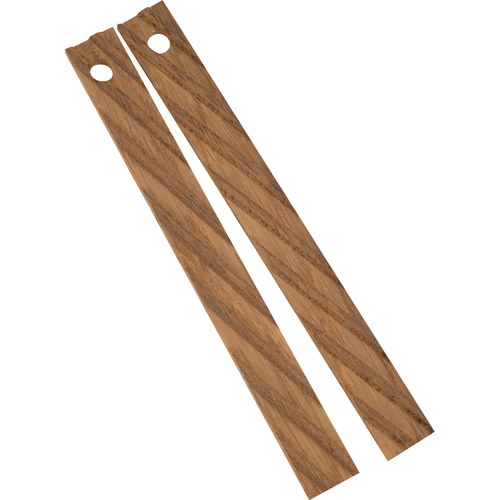 BeerStix Carboy Sticks are one of the simplest and easiest forms of oak to use in beermaking. Simply add one stick per 5 - 6.5 gallons, and enjoy the results a couple months later. When it comes to removing the stick, there's no fumbling around with cubes trying to get them through the neck of a carboy. These are made with a hole at the top so you can lift the Beer Stix out with fishing line when done. The Carboy Beer Stix are an awesome addition to the homebrewers aresenal. Use them to take a recipe to a fun and delicious next level. Already make an amazing stout, or brown? These are prime candidates to age with some oak, and enjoy the rich results! American Oak toasted to a Medium + with the beerstix milling will give you flavors and aromas of roasted coffee, light chocolate and honey, as well as some spice notes and hints of leather. Every beer will accentuate, or mask different flavors from the oak, so expect some variation between beers! The Beerstix miling gives 60% more surface area compared to the Winestix, speeding up the extraction process, and getting you a beer that has a rich oak character, in less time. The Beer Stix are also milled thinner than the WineStix, allowing for denser toasting. Flavors & Aromas - Roast Coffee, Light Chocolate, Spice, Honey, Nutmeg, Leather Hints. Please Note - Allow 2 months minimum extraction time to balance the extraction of short and long grain from the Stix. Removal of the wood early only allows certain extractions of flavors and primarily from the short grain in the BeerStix® milling.